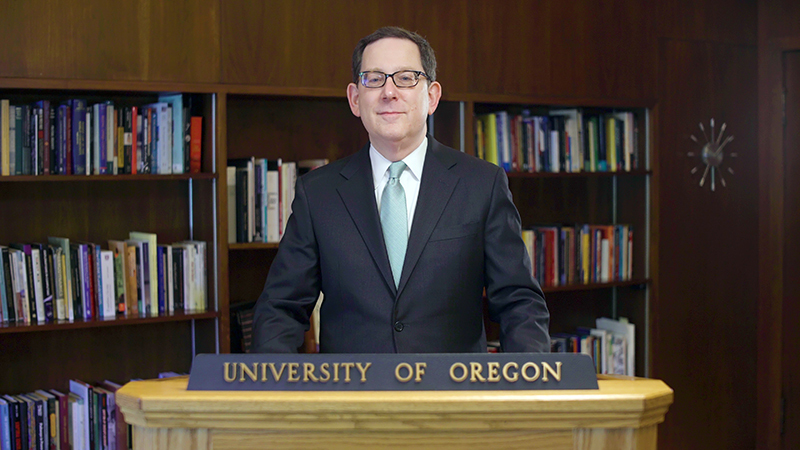 In a recorded state of the university address, UO President Michael H. Schill announced a set of new initiatives designed to have “meaningful and lasting impact” on the world. The president's address, planned to take place in the Erb Memorial Union ballroom, was disrupted by protesters who took over the stage. Schill instead posted a taped version of the speech, highlighting past accomplishments while promising future strides in the pursuit of excellence. Now in his third year in the role, the president acknowledged the challenges facing the university and humanity, but he opted to not dwell on what he described as the earth literally shaking, storms raging and the sea rising. “There are clashes in the streets, sideways glances, legislative and political gridlock and finger-pointing about who is to blame and how we came to distrust each other,” Schill observed, before quickly pivoting to the role of higher education. One anonymous donor has made a gift intended to signal significant confidence in the university’s ability to make such an impact, while challenging Schill and the rest of the campus community to seize upon new opportunities. The Presidential Initiative in Data Science: Boost the UO’s capacity for “big data” and helping to fund faculty hires across campus. Matching funding for nine endowed chairs: Attract and secure up to nine eminent faculty by providing matching funds to endow faculty chairs, in each of the UO’s schools and colleges, including three in the College of Arts and Sciences. Media Center for Science and Technology: Explore how communications can better advance scientific discoveries through a new interdisciplinary research center in the School of Journalism and Communication. The Oregon Research Schools Network: Increase the college readiness of the state’s high school students through a pilot program that will embed faculty members from the College of Education in Oregon high schools. Programming for the Black Cultural Center: Support student success programming at the upcoming student facility. “Each of these five investments from the anonymous gift is designed to harness our existing strengths, talents and initiatives and build something new, exciting and important. Each is about promoting excellence,” Schill said.